God, who is the I AM, is THE WORD! The early Jewish patriarchs “experienced” their faith. Abraham, Isaac, and Jacob had to “live” their faith long before it was written down. They had to learn to “live by faith” in a “living” God, something totally different then those who worshiped idols around them. God then gave that word to Moses in written form. The Jewish faith since that day has taken the “experience” of their forefathers and the “written” document of the ten commandments and the book of Mosaic Laws in the Old Testament, molding them into the Torah, the first 5 books of the Bible. Then, academically, they created the Talmud, the “rabbinical book of interpretations” “about” the truths in the Torah. The Church has done the same: “experiencing” Jesus is the gospels and book of Acts, to writing commentaries on the “theology” of Christianity. The only way for the Jew to “know” their faith is the same way the Christian can “know” his faith: THROUGH A PERSONAL “EXPERIENCE” WITH JESUS CHRIST! Ask Saul who became Paul because of it! The rock of the rabbinical educational world “experienced” Jesus, and the Holy Spirit “retooled” his mindsets about the church from persecutor of the church to protector. The “retooled” 21st Century Church needs a “Saul to Paul” experience again! Paul was trained under the best rabbinical scholars of his time, but had his “theology” not only challenged, but drastically changed because of his “experience” with Jesus Christ. All Jesus asked was, “Saul, why do you persecute me?” Saul had no idea that he was persecuting his God; he thought he was defending his God! It is a hard lesson to learn that often when we “academically” defend our God, wanting to be its protector, we become the very tool of “persecution”, its attacker and “preventer”! Amazingly only after Paul “experienced” Jesus could he be transformed from “persecutor” to “protector” understanding his vertical relationship with God (John 3:16) with his horizontal relationship with Jesus (I John 3:16), the body of Christ, in whom he becomes their protector. Paul never physically saw “Jesus on the Cross” as the other apostles were afforded the opportunity to do, but he “experienced” spiritually “Jesus on the Cross” when a supernatural God knocked him off his horse, retooled his spirit and mindsets, and had him defend Jesus, the Body of Christ, as its protector as an apostle. The five fold apostles are the Church’s “protectors” because they “experience” Jesus in a different point of view than others. They see God’s supernatural intervention in the natural life of the Church, in other words the Cross! Watching, observing, experiencing the dissection of the supernatural into the natural is something an apostles cherishes, for that insight is so unique, so insightful, a gift from God. This vision give the apostle the opportunity to “see over” what the Holy Spirit (the supernatural) is doing in the Church (the natural lives of the believers in Jesus Christ). He receives insight is “seeing over” the various and different giftings that are in the Church, knowing when to encourage those with those giftings to be “released” for the benefit of the Church as a whole, bringing unity in the Body of Christ, and maturity in the individual believer. Often, people I know, who have an apostolic spirit and point of view of the Church, were at one time “persecutors” in their early days as a Christian of the very things they later come to “protect”. A true five fold apostle who starts out as a Saul, a defender of the faith, often has to get knocked off of his “theological” horse, blinded, only to regain his spiritual sight by having his “scales” of the way he “sees things” fall off, only to gain the sight of “seeing over” the very thing he has now been called “to protect”, and be retooled to being renamed. 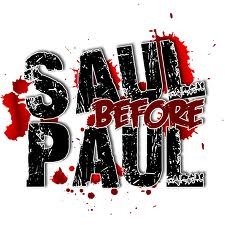 Saul would never go back to his old name nor theological beliefs when he became Paul. Saul, the “persecutor” of the faith, became Paul, the “defender” of the faith to which he would be beaten, imprisoned, mocked, rejected, stoned, and even left as dead for! There is a retooling at how we, the Church, needs to view the apostle. If there was ever a time we need “apostles”, it is today! I believe some of those who criticize the five fold, defend that the apostles died when the Canon was established, who persecute new movements of God, the Saul’s of our generation, just may be come the Paul, the retooled “protectors” “looking over” the Body of Christ in an attempt to “release” the giftings, ministries, and points of view that already exist in the Body of Christ, just waiting for their release. Sauls, go ahead and criticize these blogs I write, for I prophesy that your criticism may be the very tool that will lead you to your road to Emmaus, the knocking you off your horse, the restoration of your blindness to sight, and your renaming of becoming a Paul, a protector of what the Holy Spirit is doing in our midst! Newer PostWhat is the 21st Century Church Truly Investing In? Older PostRetooling: Education Reform In Our Churches?